Excerpt From the Memory Book At Bill’s Memorial, by Steve. Sunday at The Trappist in Oakland several dozen readers and friends of Bill Brand gathered for toasts and stories about our friend. 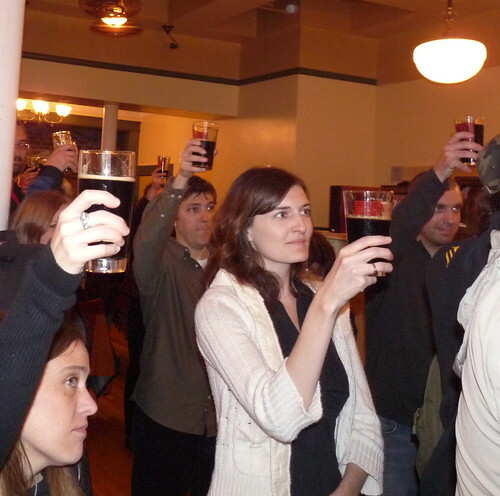 We were pleased to see so many of Bill’s readers, as well as his fellow beer writers and the brewers and distributors he wrote about, in the room. Jay Brooks has written a good wrap-up of the day’s bittersweet sharing of stories and memories at Brookston Beer Bulletin. Steve took some additional photos … we have put them into a Beer by BART flickr set there. It was a sad day, but with many happy moments and memories, and a lot of smiles. (A few very short video clips will be added to that photo set soon). We’re happy to note that the newspaper group behind Bill’s blog — Bottoms Up/What’s on Tap — has put out the call for new blogger(s) to carry on in his tradition. It will be hard to match Bill’s respect for brewing (and beer drinking) people. Here’s to somebody stepping up and making a goal of continuing his tradition of sustained, sincere enthusiasm for beer and this community. Tags: "william brand" "bill brand"